-Self-propelled operation with forward and reverse controls gearbox and handle controls. 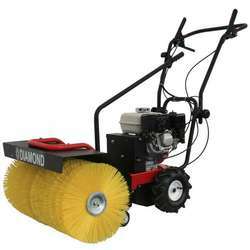 -Suitable for clearing snow, dirt and other debris from sidewalks, parking lots, ice rinks and other flat surfaces. -Adjustable (lock-in) brush angle control for directing sweep debris. -Commercial duty brushes allow for hours of hard surface sweeping. -Heavy duty pneumatic wheels for extra traction control.